Join Ann for a botanical art holiday in France, Spain, Italy and other countries. Buy Ann’s recommended equipment to get started with your own botanical artwork. 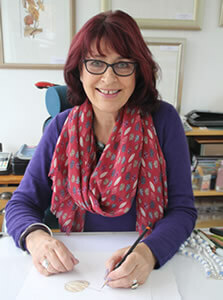 Ann Swan is one of the UK’s leading botanical artists working in pencil and coloured pencil; well known for her fine detail, vibrant colour and strong contemporary style. Awarded four Gold Medals by the Royal Horticultural Society, her work is represented in the prestigious Shirley Sherwood Collection and the RHS Lindley Library. She is an enthusiastic and nurturing teacher running regular workshops from her studio in Wiltshire and worldwide, this year visiting Spain, France, Italy and the USA and her book ‘Botanical Painting with Coloured Pencils’ is a leader in its field. Sign up for FREE membership and receive ‘Pencil Points’, our online newsletter!